There are 3 parts to this dish. 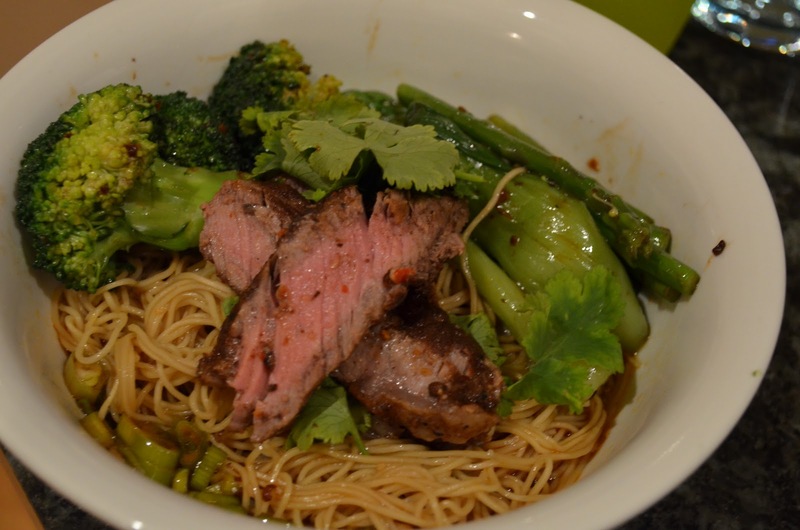 Rib eye steak, dan dan noodles and vegetables. Of course, this is from my favourite chef, Jamie Oliver, 30 minutes meal cookbook. Put a griddle pan/normal frying pan on a high heat. Season the steaks with salt & pepper. Pound the Szechuan pepper using a pestle & mortar. Sprinkle about a pinch over the meat along with couple of teaspoons of five-spice. (Keep the rest of Szechuan pepper for the noodles later on). Drizzle a little olive oil over the meat, then rub the meat all over so it picks up the flavours really well. Put the steaks on the hot pan to cook for about 2 minutes on each side for medium rare, or until cooked to your liking. Get a clean board/plate, drizzle it with olive oil and lay your steaks on top. Take the pan off the heat. Peel the ginger then finely grate it, with the chilli and garlic, over the steaks, just to flavour and perfume. Squeeze over the lime juice. 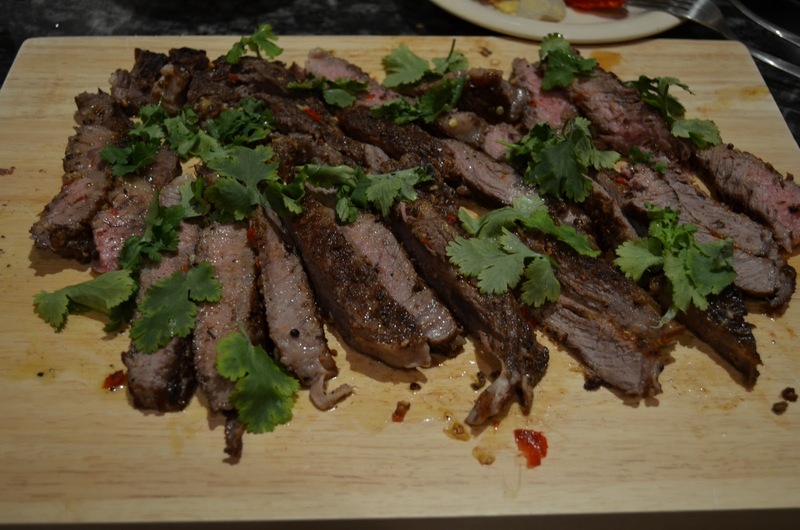 Slice the steaks at an angle into strips, then toss so they mop up all the flavourful juices on the board. Garnishes with some coriander. Boil some water in the large saucepan (for the vegetables & noodles). Season with a pinch of salt. Halve the bok choy. 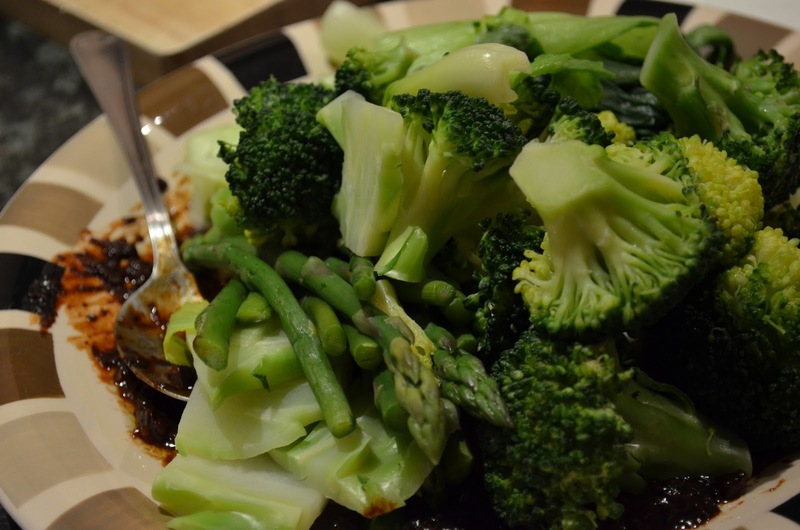 Trim the ends off the broccoli lengthways, then add to the pan with the bok choy and asparagus. Put the lid on. It should only take a few minutes to blanch the vegies. Spoon 1 heaped tablespoon of black bean sauce into the middle of a platter and spread around. Squeeze over the lemon or lime juice and drizzle over a lug of olive oil. Use tongs and a slotted spoon to take out all the greens, getting rid of the excess water. Pile on top of the black bean sauce. Drizzle over a little extra virgin olive oil. Only toss to combine when you are ready to serve. 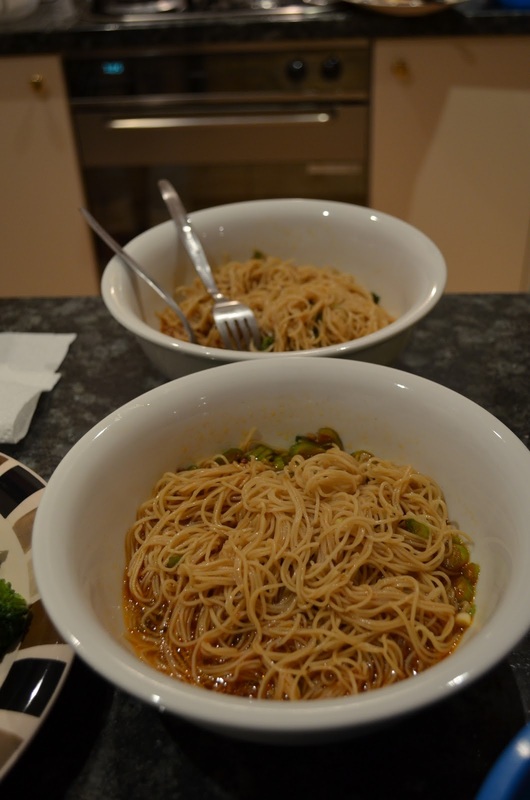 Add a pinch of Szechuan pepper that you kept earlier on onto each serving bowls. Pour 1 1/2 to 2 tablespoons of chilli oil and 1 tablespoon of soy sauce into each serving bowl. Crush 1 unpeeled clove of garlic and divide the pulped flesh between the bowls. Trim and finely slice the spring onions and divide them between the serving bowls. Squeeze a small amount of honey into each bowls. Add the nests of noodles to the water you used for the greens. Add the beef stock cube. Squeeze a few drips of lemon juice. It should take only a few minutes to cook/soften the noodles. Use tongs to divide the noodles between the bowls. Ladle over a little broth. Put some greens on top of the noodles together with the beef. You could add beansprouts for garnishes. In this case, I don’t because I am not a fan of beansprouts. This recipe certainly took more than 30 minutes to cook. Unless you have made it once and are familiar with the instructions, it will take about 45 minutes to 1 hour to make all three components. But it is worthwhile!